"A little advice about feelings kiddo: don't expect it always to tickle." It's a pattern that has been repeated countless times in those "movie-of-the-week" specials. A tragedy occurs, the protagonist suffers debilitating depression. After two hours, everything is fine, with the help of an earnest psychologist, one willing to really reach out and touch the lives of those around him. 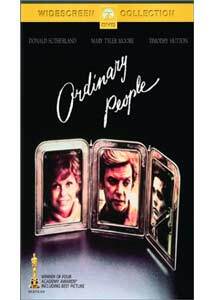 The plot was driven into the ground in the 1980s, and now only pops up on Lifetime, but its origin can be traced back to one film: the 1980 Best Picture Oscar®-winner, Ordinary People. Calvin (Hutton) is, on the surface, an ordinary teen: a good student, popular, and a member of the swim team. But since his brother's death, Calvin hasn't been functioning properly. He suffers from extreme depression and guilt, far beyond what could be considered natural mourning. After an unsuccessful suicide attempt, he agrees to see a psychologist (Hirsch). He certainly isn't getting the understanding he needs at home. His father (Sutherland) treats him as if he is a fragile ornament, not to be touched, and his mother (Moore) has shut him out of her life completely. With the help of Dr. Berger, Calvin must learn to survive, even if it means facing his troubling past. Actor/director Robert Redford won a multitude of awards for this, his first film. It's a rather odd choice, in that it's the type of story that demands subtle, invisible direction. Not the kind of thing that usually gets you noticed. However, in playing it low-key, Redford has really extracted the power from the screenplay (by Alvin Sargent, based on the novel by Judith Guest). Scenes unfold slowly and methodically, with long takes and elegant framing, providing a showcase for the actors. While the pace may seem plodding to today's audiences, it fits the material well. The ending also feels a bit rushed, too easy. Calvin has a "breakthrough," and he's seemingly cured. The finale doesn't give the impression that this is just one step to recovery, albeit an important one. Redford deserves praise for, more than anything, his work with the cast. He managed to get decent performances from each and every actor. Mary Tyler Moore plays against type as the controlling matriarch, and is very effective. She's able to layer her pain with unconscious resentment for her remaining loved ones (and herself). Sutherland is appropriately subdued, almost the traditional dopey-dad. He does open up, though, and by the end, his performance is perhaps the most nuanced in the film. Timothy Hutton won honors for his work, and while I found him to be adequate, he was a bit too showy for my tastes. A bit too much yelling and crying, especially in his final, confrontational scenes. Hirsch, usually a comedic actor, also does fine work, but his character isn't really given a wide range of emotions to work from. Over the years, Ordinary People has lost some of its luster. Many see it as unworthy of its accolades, as it triumphed at the Academy Awards® over Scorsese's masterpiece Raging Bull. Perhaps it didn't deserve to win (time is, after all, the best judge of quality). But its still an excellent character study, and, if nothing else, responsible for bringing male depression to the forefront of American consciousness. Image Transfer Review: Though Ordinary People is only 20 years old, like many 1980s films, it has aged rather poorly (due to the lower grade filmstock used at the time). This new transfer, then, probably looks about as good as it is ever going to. Colors have a limited, muted palate (no doubt intentional), with good shadow detail and solid blacks. I noticed no artifacting or edge enhancement. However, the picture is very soft, with a noticeable lack of fine detail. Also, the materials weren't in the best condition, as lines, scratches, and specks pop up here and there. Audio Transfer Review: I'm not one to fault a mono track just because it doesn't use all my speakers, so rest assured, the grade I've given is representative of the quality of the mix in terms of available materials. The biggest problem is a lack of fidelity. There is little support for the dialogue and effects, and as a result, they come off sounding very harsh and grating. I honestly had to turn the volume down during the more emotional, louder scenes, because the audio was so shrill. On the other hand, the score, what little of it there is, sounds fine, with nice dynamic range. Extras Review: Though Paramount delayed its release for six months, pending participation from director Robert Redford, Ordinary People has arrived sans features, save for the theatrical trailer. I must also comment on the woefully inadequate chaptering. Some run longer than 15 minutes. Though it has lost a bit of its potency over the years, Ordinary People remains a moving experience; the fact that psychology is promoted as an catch-all cure for depression does little to diminish the message of hope. Sadly, Paramount has offered little in the way of extras. Hardly fitting for 1980's Best Picture winner.